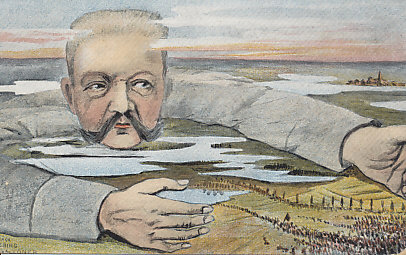 German General Paul von Hindenburg luring a Russian army into the Masurian Lakes. In the Battle of Tannenberg, the Germans destroyed the Russian Second Army, killing 50,000 and taking 90,000 prisoners. The Russian First Army managed to escape the same fate in the First Battle of the Masurian Lakes. 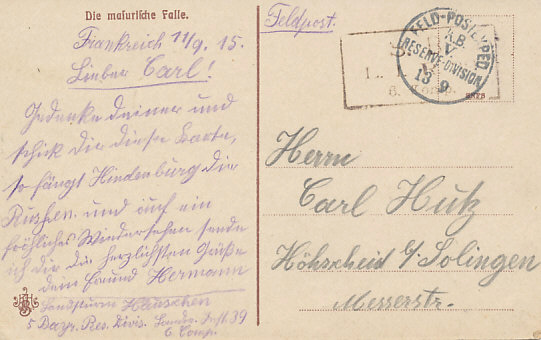 The postcard was sent from France September 11, 1915. With Germany's strength focused on defeating France, only one German army under General von Prittwitz faced two Russian armies in East Prussia. Fearful of being caught between the Russian First Army to his east, and the Second to his south, von Prittwitz hoped to defeat first one and then the other, before being caught between the two. Mobilizing more quickly than Germany had anticipated, the Russian First Army invaded East Prussia and defeated German forces in the Battle of Gumbinnen on August 20. With this defeat and the news the Russian Second Army was advancing from the south, Prittwitz telephoned Chief of the General Staff von Moltke to relay his plan to retreat over 100 miles. Moltke replaced him with Generals Paul von Hindenburg and Erich Ludendorff. The two Russian generals, von Rennenkampf and Samsonov, did not coordinate their movements. In prewar maneuvers, Samsanov had been slow, but now moved more quickly. Von Rennenkampf moved more slowly. The Russians communicated either in clear text, or in code the Germans knew. With Rennenkampf slowly advancing from the east, the Germans turned instead to defeating Samsanov advancing through forests and swamps from the south. Leaving a thin defensive line to slow Rennenkampf, the mass of the German forces attacked Samsanov. On August 26, the Germans struck Samsanov’s right, driving it back into Polish Russia. 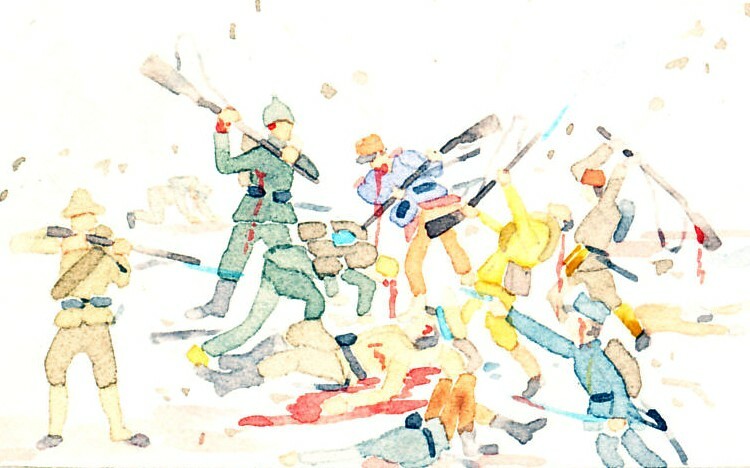 The next day, under an artillery barrage, his left collapsed, also retreating across the border. Rather than falling back, his flanks gone, Samsanov advanced. 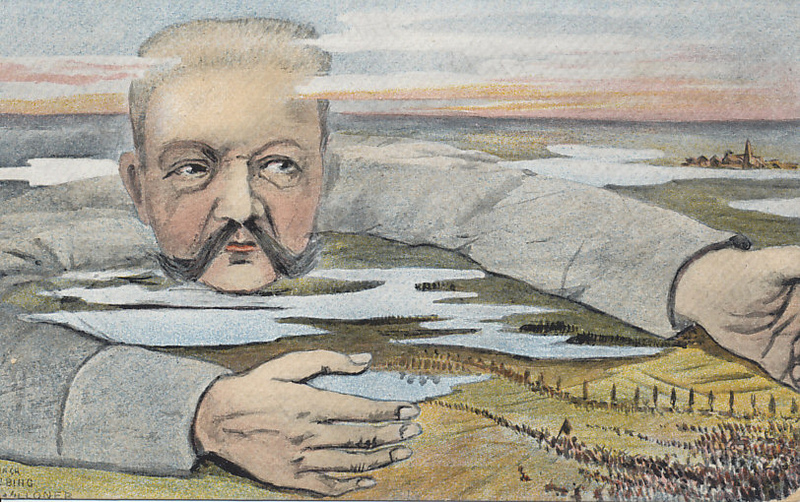 German forces formed a thin line behind the Russians, but one they could not break. By August 29, the Russian Second Army was encircled, and surrendered on August 31. The Germans took 90,000 prisoners. 50,000 Russians died, one of them Samsanov, who wandered from his staff, and was later found by the Germans, apparently a suicide.